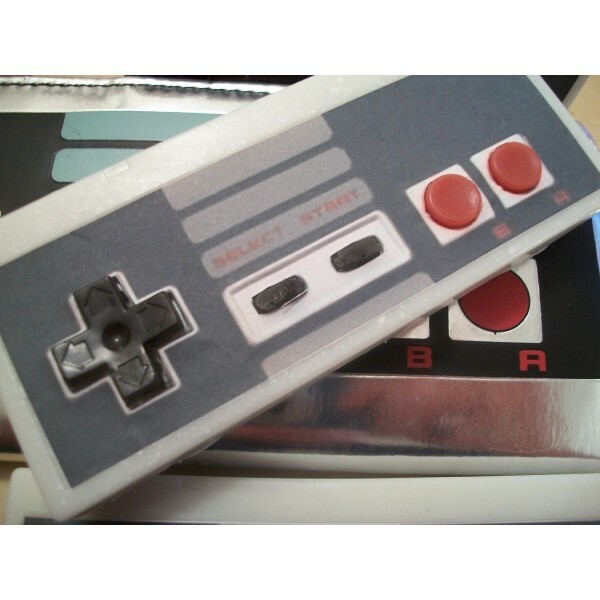 A gray NES controller parody soap, with full color black and red buttons and a black background. Made by the original creator of geek and electronics soaps, DigitalSoaps. The look of the system that defined console gaming. The gray NES controller replica soap has full color black and red soap buttons and a black background. It is the same size as the original. Great looks. And thought behind it, too. DigitalSoaps founder Chrystal Doucette has a deep affinity for the Nintendo Entertainment System. Her favorite games are Megaman 2, Tetris, Bubble Bobble and Contra, but so many awesome ones are out there. DigitalSoaps was presented with GamePro's Editor's Choice Award in August 2009. The company invented this soap and all other game controller soaps on the site.